I get insulted daily for playing a condi build for whatever reason. Condi mirage = get flamed, condi thief which i cant even play cus im not that good at thief = get flamed "CONDI THIEF NOOB LOL" , condi engi = get flamed. It's always been like this and for some reason people try to "imply" that condi is lame or overpowered which is why they even call you out on it in the first place but in reality that's not even remotely the case ? ~your enemy has all chances to react cus he can > cleanse, resistance, dodge. If you die to condi it happens over time and you have time to do something about it. imo the only problematic condi is builds that can spam weakness (necro) cus weakness hard-counters power and it also counters dodges and in general everything in the game, it's too broken and now there are too many weaknesses thrown all over the place while a few years ago that was a "hard to get "debuff cus it was scarce but it was good so it felt more fair, now it's just spammed everywhere..
hell, even a base stat, Toughness reduces it, but does nothing to stop condi damage. Protection is widespread through the classes and reduces power damage by a large chunk, there is no similar boon for condis. Weakness is also common throughout classes and reduces power damage by a large chunk, there is no similar condition that reduces a players condi damage. if you click a skill that says it deals 8k burning damage, you don't need a lucky crit, that is the damage it will do. so you are usually required to be a glass cannon. all it takes to deal high condi damage is the condi damage stat, leaving plenty of room for vitality, healing and toughness. protection isn't widespread, AT ALL. Lol. It's limited to certain trait lines or a very few skills for most classes and most of these trait lines arent good apart from the protection, for most classes. let's make small comparision in here, shall we? there is alot more active defences in game against power damage (and as pointed out - passive too - toughness reduces incoming damage while vitality gives you buffer to live throught it, while only vitality out of these two benefits survivability against condi.) So while at extreme certain power builds can achieve "one-combo-ko" in overal power build needs you to actively stay onto enemy to pressure it - while condi build let's you just come in once in a while, apply crapload of dots, and then disengage while still leaving pressure constantly applied unless enemy manage to cleanse or resistance it. Which is why some of players are not liking condi cheesers. Skill is not determined by whether you go power of condition. It's determined by your exact complete build, gear and all, and the enemy you are facing. I get where you coming from with this however its much easier to land condi burst with pof than core so to do 30 things is a bit of an over reaction. I thought I was having deja vu, til i realised the condi/power in this were the opposite way around. So why if I'm blinded and try to land my skill which inflict condis it will say miss? Didn't you say no debuffs affecting condis? Aegis and blocks can prevent condis being applied to you, didn't you know that? There is no such thing like unblockable condis. Yeah, we are done... only 2 specs out of all specs works as condi. Condi thief is a meme build who got nerfed a lot and it's not a problem for good players, condi soulbeast doesn't exist even tho soulbeast seemed a condi focused spec, renegade works better in power than in condi even tho shortbow, burn guard meme build, berserker condi only good in pve, condi engi another meme build. And i don't see personally the difference between a scourge spamming shades in mid and activating the F skills and a reaper who goes shroud in mid and spam shroud skills, probably reaper is actually easier to play and to get results with than scourge because without a firebrand scourge is paper. And same as power burst, condi burst can be avoided with dodges, blocks, evades, blinds and kiting, if you kite well a scourge you can kill him with 99% health remaining. People complain about condis because they are noob against condis. 1. First skills says remove burn torment and poison. 2. Second skill says remove 3 conditions. The right order to cleanse is before using the specific condi removing skill, so the first skill and only after the generic skill which removes 3 condis or maybe the generic one removes burn and torment leaving you chilled and crippled and the specific one remove only poison. You did not understand that it's about builds and not damage types. Condi mesmer is not broken because it applies condis but the type of condis (punishing movement and skill activation) while itself being extremely mobile and evasive. Opponents have to move and burst to counter it which is exactly what its specific condis do punish. Condi thief is just dot and run. It's the most lame and skill-less playstyle possible. Other condi specs - not even the infamous condi scourge - are really broken at the moment. Condi mesmer and condi thief have probably the lowest skill floor in the game and are in fact noob specs. Nevertheless I don't understand why you are getting flamed for playing condi engineer. Did I miss something that this spec is suddenly overpowered? Can't believe what I just endured reading. Do you realize that by those deceptions, half-truths and alibism you are using to defend something you love, something that everybody knows (and proven) to be totally broken, you are hurting the game? You are intentionaly damaging the community by desperately trying to keep something that is so unhealthy. I am gonna go ahead and guess this is all because you main Condi Mirage and you can't put up with the fact that most people already figured out there is almost no skill involved and you simply freaked out when you faced that reality. I originally made a long post adressing enterity of your Post but I realized there is so so so so much wrong with your post with so much personal bias in it, that I canceled it as it would be totally pointless arguing. the big difference is that on power build if you blind just before big meaty hit you can nullify huge chunk of burst right there (same case for aegis). in comparision there is no such thing like "big meaty hit" for condi equivalent. also no Aegis nor blocks will affect condis already applied. if you want to argue all condis are unblockables - with advantage that certain boon makes you invulnerable to them. Oh common and didn't even mention Condi thiefs? also condi guards used to be a thing, was kinda lakcluster tho in the past due to only one damaging condi which gets easilly countered by purging. condi firebrand is slightly better for having access to bleeds, and then hell, casuall 2k per tick burns. here is a random bit of trivia for you - there was a time that on my randomly assembled guard build I was wreckign power thiefs easilly,and only tsruggled against condi thiefs - you know why? because first one required to be revealed to attack me while the other could just outcondi my cleanses (and had alot of them) and then mantain the condi pressure without even being in there anymore. Heck the only reason you have seen rise of power thief builds into relevance is due to certain builds being able to one-combo most classes - before that is was easilly counterable kitten - as opposed to condi thief. hybrid, not pure condi. Soulbeast has always had strenghts towards both power and condi. renegade works better in power than in condi even tho shortbow, burn guard meme build, berserker condi only good in pve, condi engi another meme build. you can't just discard every viable condi build aside from most broken ones as "meme builds" this is not how the game works. I'd like to point out in here that "condi burst" is already something that was not supposed to happen by design - power was supposed to be bursty and condi is all about sustained damage over time. but truth remains that good condi build can still have pressure applied to you long after dude applying pressure went off to the other side of sPvP map. I'll disagree in here - everyone capable of logical thinking will know what is the "proper" order of using these two skills in cases where you have crapload of everything on you - what needs experience/skills in this aspect is ability to execute - less experienced players tend to panic and misclick skills in situation of great danger (and having pretty much every condi on you usually is one of those situations. And I still believe you are greatly underapreciating counters toward power damage and still am of opinion that your (very broad and risky while at it) thesis of condi builds requiring more skill to pull off sucessfully is untrue. I only made that condi daredevil for ezy OPIE roamin' in WvW! THERE IS SUCH THING LIKE CONDI ENGINEER?! I see someone like Vallun doing a 2v1, I go in and +3 to last hit him, I beat Vallun. I am Skilled. Literally nothing in this game requires skill. It was easiest 1v1 of my life, he went down in one hit! Sorry @Vallun.2071 , you've been outskilled. Idk, speaking for ALL THE CONDI BUILDS in a single post is kinda wrong. 1) There are builds, which apply long multiple conditions with very limited amount of stacks. Like Scourge, for example. It's harder to cleanse, because there are really a lot of them and cleanse is usually 1-2 condi at a time. But at least it won't kill you outright - you have plenty of time to deal with it or run away. 2) There are builds, which apply a single but very powerful condition, like burning. Like Firebrand for example. But they can reapply it quite easily after cleanse and the stack amount is high. So you have to cleanse constantly. 3) And finally, there's condi mirage, who can apply a HUGE amount of stacks of VARIOUS conditions (like 10-15 stacks of confusion, 10-15 bleed, 10-15 torment and 3-6 burning, depending on a build). All 4 at the same time. Albeit, for a VERY short time (1-3 seconds usually). Which results, basically, in a CONDI BURST. 2 ticks of confusion for 3k each, 2 ticks of burning for 1k each, 2 ticks of torment for 2k each, 2 ticks of bleeding for 1.5k each. And BOOM! -- SUDDENLY target loses 15k hp (unmitigated by toughness/protection/weakness) in a matter of 2 seconds. My point, is that condi cleanse in its current state (where most cleanses are 1-2 stacks at a time) is not SUPER effective at countering mirage condi-burst. Also, add there's another important factor, that a decent percentage of condi mirages are not in fact pure condi, but are instead HYBRIDS. Who are also capable of quite a nice power damage with crits and whatnot. ON TOP of that 15k per 2s condi-burst bomb. Scepter-3 with Viper amu hits for 8k on light armor. Yeah, it's easy to dodge and all that, but 8k is not a kitten joke. The only reliable counter to power mirage condi-bombs is extremely well-placed resistance. And killing clones as fast as possible. And not all builds out there have that. When I mentioned holosmith, boonbeast, spellbreaker, shiro rev, core guard. All those are power specs who dominates the meta, the only 2 condi specs are scourge and mirage. Scourge and mirage received quite a bit of nerfs and tune downs, things like condi thief completely shifted out from the meta, and now power damage dominates, and it's far from being more skilled gameplay, because when an holo can spam autos for 3k-4k you understand something is wrong. And about condi burst, you get condi bursted only if you eat multiple skills at the same time, for example if you stand still inside shades don't dodge out of it, it's normal you get punished, what do you expect to receive only 1 stack of torment and poison which vanish in 3 seconds? Same as you dodge power damage, now dodge condi burst as well. But if you think holo cc spam and 3k autos are somewhat skilled gameplay to pull off maybe we play a different game. Yes. That's part of the rotation tactics that win matches, keep points controlled by your team by maintaining an advantage over the enemy. That is , indeed, skill. It's called "tactical awareness" by some "opportunism" by others. But it gets you points, and points get you a win. So it is skill, if you win the match thanks to it. Was that on raid boss ? Otherwise how do you land 20 torment/20 bleed/20 confusions/3-4 burns instant? Where did go those cleanses that remove 3-5 or every single condition ? Stealthremoved or you prefer to not mention it? Wow, here we go again. Are we really going to defend the effectiveness of Condi vs. Power? Folks, you do realize that the OP has a point here. Perhaps using Condi Mirage for his argument doesn't do him any favors, but he does have a point that Power builds do not require combos to land in order for them to be effective and to be more effective than Condi builds. Case in point, the difference between Ranger greatsword and dagger. Autoattack on GS, hefty damage, and depending on the runes and amulets you use, can do up to 3-5k damage. From a single hit. Autoattack chain on Dagger, while applies three different Condis, not all are damaging Condis and can be cleared. Base damage on Dagger is significantly lower to off-set the amount of Condis it can land on an opponent. But, the point is that it can be cleared. Not to mention, the cancer spam that is Maul and if you successfully land the daze on GS 5, it's replenished. And it can hit multiple enemies within a small radius. But that is a discussion for another time. Another example is Ranger longbow and shortbow. Have you ever wondered why people hate using shortbow in PVP? Despite its utility (evade, immob and cripple, stun), it just doesn't deal damage quickly enough to down an opponent. Its AA can stack bleeding pretty high, but once again, it can be cleared. Traits in Skirmishing are absolutely needed to make its bleeds dangerous enough for the opponent to worry about cleansing it. Otherwise, shortbow is hardly ever a worry in PVP. Longbow, on the other hand, coupled with Quickening Zephyr and a healthy dose of One Wolf pack, can down an opponent within four seconds or less. Yes, it can blocked or dodged, but now opponents have wasted their blocks and dodges only to be knocked back, Autoattacked, and barraged. Now, my point here is that Longbow can deal enough damage without using Quickening Zephyr and One Wolf Pack, but with the two skills, it is nearly unstoppable. Now, for any Condi weapon to be viable, it needs to have specific runes and amulets in place that will increase the damage of the Condis and the base damage of the weapons. Power weapons don't need that. No one can argue that power weapons need combos to win fights. Because their base damage can defeat Condi damage at any time of the day. What people complain about is Condi burst, which Condi Mirages excel at. But, not all classes have access to Condi burst and definitely not as many Condis as Mirages do. Multiple stacks of multiple conditions cannot function as Damage Over Time, which is what Condi is supposed to be. What should be nerfed is the burst, not the conditions themselves (though I would take another look at confusion and torment, like what the fudgenuts are those). And I think that's what most players fail to realize. Well, if you reached the end of my rant, thank you for taking the time to read it. I'd give you a cookie, but unfortunately, I've eaten them all. What's funny is I have literally had players stow weapons and stand there after they take a condi burst from me on my mirage. It barely tickles them. And almost all conditions from a mirage are a pretty short duration. Confusion especially is something like 4 seconds at its longest in PvP. If you're in a 1v1 with a mirage and don't dodge their burst. Stow weapons and stand for 2-3 seconds. And you'll be fine. So many people just spam through their skill bar trying to lock down the mirage. If they stopped for a few seconds they'd be fine. and again, i mentioned this earlier - why does every ignorant player overlook the fact that condi builds also run 2k power so it's not just condi its literally a hybrid build..? 1) I am talking Condi Mirage, not Condi in general, because I could smell by miles away that your post is based purely about your cries of "Mirage not as OP as it was so now I can see how little I actually achieved". 2) Historically speaking LBs never represented whether profession is OP or not, not to mention Condi Mirage is not there because it carries players in solo, but for duo players choose better comps and those are the ones that are in LB. Also, players in LB use to keep their post with Mirage when theirs not Duo on, even though it's not their main which alone speaks for how little effort it requires. 3) Hybrids are even worse, you got both Condi and Direct on very high level while having the same defense as normal direct. While with Condi only, you can happily have two defensive stats or one major defensive with major condi, so difficult, huh. 4) It seems to me that you are trying to pretend there are so few Condi Mirages, that's a new worse lie I've ever heard. I never have less than two and never had even during season, nor did any single of the people I know or spoke with. There are many passive/traits that will prevent the full burst to down the player. Note that there isn't a single passive that will prevent you from dying to conditions. Right now, this isn't a skill question, but it's really hard to play a full burst build in this meta, whereas probably any average joe can expect good results running a condition build. You get the proof of this where a lot of players who have no idea how to play capture points managed to climb with scourge or mirage. Im confused . If you claim condi builds to be absurdly OP doing million things at once. Why among condi builds viable only scourge(with pocket firebrand) and mirage? Where all those broken condi soulbeasts ,berserkers etc? You mean only endure pain and reflexes? Elixir working for both damage types. Passive transmute, shrug it off , cleansing fire automatically remove conditions . Death prevention traits work on both damage types. I'm 95% sure at this point that incisorr is a troll account. Most of the times the condi burst comes from pressing keys while having 20 stacks or plus confusion. And it's the same when an holo use holo#5 and CC you because you don't dodge and he melts you immediately one second later, or if you fail to dodge bull's charge and get punished. You can avoid being condi bursted using blocks, evades, or dodging at the right time. Bad players are not used to it in low leagues, they panic and random dodge and get punished. Trust me if you face a noob mirage he won't be able to kill you if you are a better player and know dodges, instead in many cases a pretty bad average holo can still have great chances at killing you. You have no idea how many players i encounter in wvw even using good build and high rank who random dodge if i use axe mirage autoattack at 900 or plus range, it's a melee attack and they see the purple animation and waste 1 or 2 dodges random, and they get punished immediately after because i land my shatters and axe2 no problem. Timing the condi burst on good opponent is way harder than timing power damage. Opposite rule, it's easier to apply a condi burst to a noob or bad player more than power burst. For example a bad player facing a scourge will die always in 1vs1, if you are a good player even with zero condi cleanses you can 100-0 a scourge avoiding shades dodging out of it, avoiding the elite, blocking at the right time, and immediately stunbreak when you get CC. I don't necessarily think condi is more skill based than power, they are both equal. some condi builds are cheese just like some power builds are easy to get results with. it really comes down to build+skill vs. build+skill. Why a build which works it's cheese? where are those climbers with scourge and mirage? Hopefully you talk about old builds because actually every direct damage meta build have High damage and pretty good defense too. Aegis affect condi application same way than power application. And finally, there's condi mirage, who can apply a HUGE amount of stacks of VARIOUS conditions (like 10-15 stacks of confusion, 10-15 bleed, 10-15 torment and 3-6 burning, depending on a build). All 4 at the same time. Where is this op button who put all 4 at the same time ? condi so overpowered to climb hurr,durr. 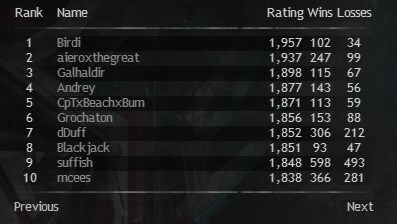 I only skimmed thru the rest of the names till top 50 cause "rating system" doesn't really prove skill or no skill and i only saw 2 other mirages and i didn't pay much attention but you get the point. Exactly. I'll bet everyone that complains about condi mirage doesn't have a stow weapon hotkey and probably runs during torment. If you're struggling against condi mirage just make it a point to focus on stowing weapon and not moving when you are inflicted by confusion & torrment. It feels unnatural and clunky to fight this way at first, just gotta practice it. Then the next thing to learn vs condi mirage is when to clear condis vs waiting them out and when to try and land damage and limiting blowing offensive cooldowns into mirage cloak, distortion and blurred frenzy. This really just boils down to timing and counting the condi mirages cooldowns/vigor. Obviously everything that ive written is much harder for a less experienced pvper to do than a good pvper which is why condi mirage typically smashes noobs and gets so many forum complaints. Lol at all the people who called you a troll and said you were full of kitten then you posted proof that your ranked top 20 and you defined the classes that the other 19 play and just rained epic logic on all of it. This is a great example of how you pwn it on the forums. OOF ya non believers just got pwned hard. Yeah but, I want mirage as free kill tho, so I gotta call for more nerf. Well, the thing is, is that you have to run ACTUAL condi removal ability for that. Not some utility "which ALSO removes condies, WHILE doing something ELSE". Like Arcane Thievery, for example. I.E., most people will take a "weak cleanse + some other utility"-type spell over a "dedicated and reliable cleanse"-type spell. My point is that in lower ranks people either run weak cleanses or no cleanses at all. That's why condi builds (and especially condi mirages) wreak havoc there. 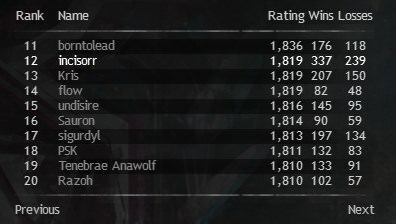 Condi mirage is OP in lower ranks - in short. And your opinion on the matter is well known: "low rating games do not matter, only top100 does". Which basically means "100 people are more important, than 5000". Which is kitten, in my opinion. The exact sentence is : people who use 100% of their class potential are more important talking about balance than 5000 with exotic builds who don't use full potential of their tools. Then it's no more kitten. Eh.. that would be somewhat true and logical sentence, at least in a context of condi cleanse. But the truth is, is that you do not really need THAT much of condi cleanse in general, unless you are going to fight a condi mirage. Where you need MULTIPLE charges of at least 3 condi cleanse, INSTANT and 100% RELIABLE. Because condi-bomb of 10 torment and 10-15 confusion doesn't last long, but it hits hard. Which is exactly where mantra of resolve comes in handy. Otherwise it's very questionable choice and has absolutely nothing to do with "use 100% of their class potential". It instead pretty much as "exotic" as it can be for a non-support build (which Incisorr said he isn't). I play mirage main, lol. Sometimes condi-hybrid mirage. And I don't have a problem winning against a condi mirage. At least it's by a LIGHT YEAR easier, than against high platinum spellbreaker, holo or boon soulbeast. Yet I still think it's somewhat unbalanced. To much less extent, than other builds out there, but still. Mechanically, most condi builds on most classes play identically to power variants. The only real difference being when the bulk of the damage actually occurs. Conclusion: everything in GW2 is easy to play. I'm perfectly fine with my own argument from another thread. If I recall correctly, you stated, that my build was trash, and I'm therefore also trash as a player. Which I won't deny, as I only play for 2 months, and I try to get better. But yet I sincerely think, that build diversity is what making this game precious. If I'm able to come up with a build, which I think is super fun to play -- I will play it. And I don't really care, if I'm handicapping myself by 100-200 rating by doing that. Some people do care, therefore they play the most effective and broken powerfull build there is. Like boon holo, boonbeast, or spb. Some people actually find these builds fun. Some don't and only play it to achieve rating. And thats exactly why I came up with this analogy of selling the "virginity of certain places for another 100 rating". I didn't mean ALL the players with high rating, nor did I mean ALL the players who play meta builds. And yet you STILL took the offence personally. Not sure why, but I have a couple of guesses. Play condi ele and you will never be called OP again! You are still going to get flamed though for not being able to carry hard enough. On a side node: Weakness applies to all hits since 2013. You dodge power burst you're safe for the next couple dozen seconds. You cleanse condis you're struck with another batch immediately after. That's actually false <insert joke about how top 20 players don't actually know the game mechanics>. That was the case on release but since the June 25 2013 patch https://wiki.guildwars2.com/wiki/Game_updates/2013-06-25#Profession_Skills that's no longer the case and it's effects has been discussed quite a lot since this introduction due to it's ambiguity, one of the newer posts being https://en-forum.guildwars2.com/discussion/17160/can-we-talk-about-weakness. The summary is, whenever glancing procs it takes priority and essentially makes your crit chance ZERO for those hits in addition to halving the damage of those hits. Weakness has since become a very hard counter to crit-based power builds and corrupting might into weakness is one of the key ways scourge survives against those builds. As for on-topic, firebrands are more common in plat and above and their farting out condi-cleanses makes killing people with crit-based power damage much more effective than condi with damage that stays (but ofc you still need boon removal to do so efficiently). Given that 'Condi builds' in sPvP actually means Power/Condition/x/x damage given the limited flexibility in amulets, I'm otherwise on the fence. Power/Condi/x/x amulets like Sages on Scourge and Weaver for example makes use of the stat efficiency of condi to deal good damage while surviving but on the otherhand Power/Prec/x/x amulets like Paladin on BoonBeast and Reaper is still effectively used for the same purpose by abusing the ferocity from traits. Condi-burst Wizard's vs Power-burst Maurauder's is pretty much just as potent as each other.